A while back, I created the Mom-Olympics, complete with fictitious events where moms can compete for the crown and title of Greatest Mom in the Universe. It’s hilarious, and you should go read it, but there’s also an underlying subtext. 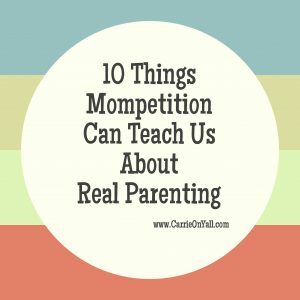 Whether consciously or unconsciously, all moms know that there’s a sidelong glance out there, an awareness that even though we say we aren’t competing, we still feel the stings of competition, or mompetition, from time to time. It’s human nature. Some moms are able to laugh off the antics of our kids, our messy houses, our messy lives, and move on. And for other moms, it’s harder to ignore, to make like Elsa and “let it go.” I straddle both sides of this fence if I’m being honest. There are days when I just don’t care if the whole world stares at me while my three-year-old throws his 89th fit of the day and it’s only 9am. And then I have days when I see the perfect mom and her perfect kids and wonder what I’m doing wrong. Here’s what I think we can learn from mompetition. Our kids don’t need us to win everything. Our kids might love the Pinterest snacks, but they also might not even care. Or they might be embarrassed when they open their lunchbox and have animal-shaped food without the crusts. Our kids can see us fail. Our kids can see us not being perfect and realize it’s okay for them not to be perfect, too. Our kids might put others down if they see us doing it to other mothers. Even if we’re being sneaky about it. Our kids should watch us stand up for ourselves. Our kids learn what to value (and whom to value and where we invest our time) from us, so where are our priorities? 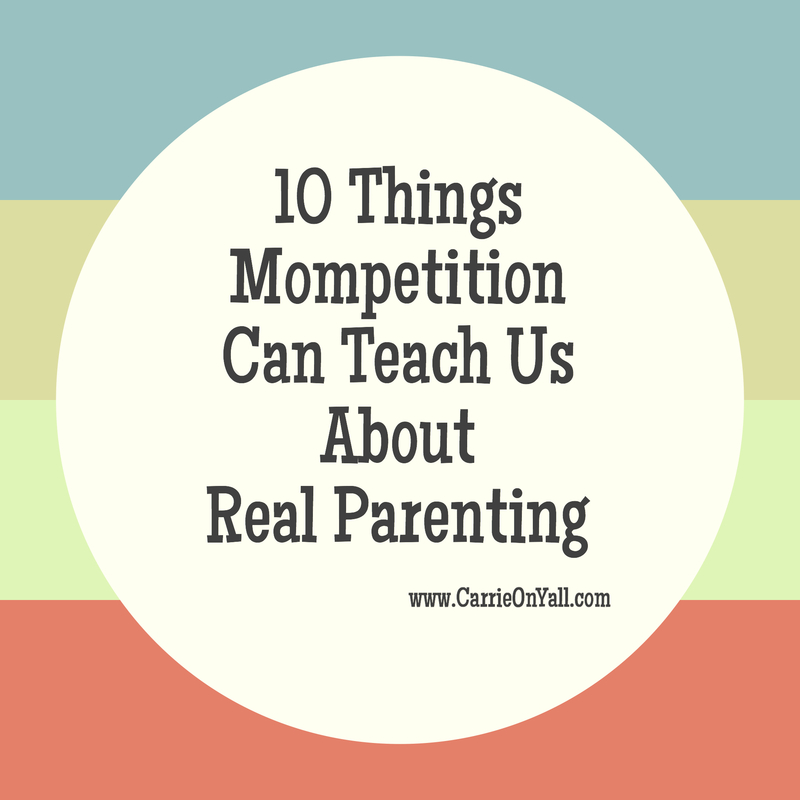 Our kids should learn to compete in healthy ways but also to be kind. Our kids should see us being ourselves instead of trying to be someone or something that we’re not. Our kids should see healthy views of money. It doesn’t grow on trees. We don’t have endless amounts. We have enough (most of the time). We work hard for it. We’re all trying our best here. I’m doing my best to bow out of comparisons and just be myself, the best version of myself I can be. That’s the main lesson I hope my kids will learn from me. Thanks for reading, y’all! You can follow me on Facebook, Twitter, or Instagram!